LeBron James hopes to "play great once again" in his bid to reach an eighth straight NBA finals. 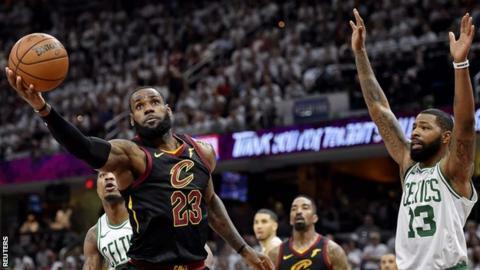 James produced a devastating display to help his Cleveland Cavaliers level the best-of-seven Eastern Conference finals against Boston Celtics on Friday. He scored 46 points, 11 rebounds and nine assists in a 109-99 win at Quicken Loans Arena in Cleveland. The series is tied at 3-3 and Cleveland must win in Boston on Sunday to progress to the finals. The winner will meet Houston Rockets or Golden State Warriors. Cleveland led for most of the game and when Boston did threaten to get back into it late on, James scored two three-pointers in 43 seconds to give his side control once more. The 14-time All Star James has made the past seven NBA finals with Miami Heat and Cleveland, and if the Cavaliers become the first team to win on the road in this Eastern Conference finals series, he will be in his eighth. "I've been fortunate enough to play some good basketball through my career," said the 33-year-old American. "Hopefully I'll get myself in a position to play great once again on Sunday." Celtics coach Brad Stevens said he "can't say enough good things" about James but he insisted his side will be "ready to go" in Sunday's decider. "This troupe's resilient," he added. Cleveland may be without Kevin Love on Sunday after the forward left the court with suspected concussion following a collision with the Celtics' Jayson Tatum.